...UCAR/CPAESS has worked with over 70 scientists, satellite video engineers, ROV pilots, mappers, mechanical engineers, ROV technician/engineers, and their interns to provide the support this project demands. In October, 2009, CPAESS was approached by NOAA to collaborate on its Ocean Exploration Mission aboard the Okeanos Explorer. Initially, this collaboration was intended to provide the project with mapping, ROV and telepresence support personnel. Since that time, UCAR/CPAESS has worked with over 120 scientists, satellite video engineers, ROV pilots, mappers, mechanical engineers, ROV technician/engineers, and their interns to provide the support this project demands. In addition, CPAESS initiated a competition program in 2012 to select undergraduate university students who would serve as sea floor mapping interns aboard preliminary 2-3 week cruises prior to the actual research cruises. Of the over 300 students who applied, 47 university students from all over the US were chosen to participate as intern mappers on a number of mapping cruises. The success stories are varied and inspirational. CPAESS solicits applicants annually. 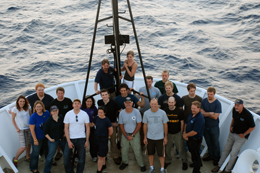 While it's nearly impossible to get a picture with all expedition participants, this image captures the mission personnel who were onboard NOAA Okeanos Explorer ship during the third and final cruise leg of the 2012 Gulf of Mexico Expedition. Image courtesy of the NOAA Okeanos Explorer Program. Since 2009 CPAESS has been involved with cruises to the Galapagos Rift, the Gulf of Mexico, the Indonesian Sangihe Talaud Region, the Mid-Cayman Rise, various locations between the US mainland and Hawaii, sites off shore of the US east coast and Atlantic canyons. Most cruises are displayed in real time videos universally available on-line. A myriad of other types of educational materials for all ages and interests are generated from these cruises and readily available to everyone.